We'd like to share with you a few key points on what makes a great crawl space dehumidifier, as well as what you can do to make sure it's working. Eliminate damp, musty odors in your crawl space once and for all by drying and filtering the air! Philadelphia Basement Systems can help you choose and install the best dehumidifier for your home. If you'd like a free crawl space dehumidifier quote, send us a call or e-mail today! 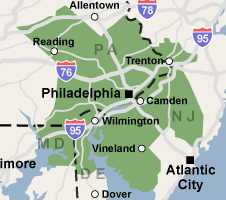 Our service area includes the Pennsylvania, New Jersey, and Delaware area, particularly Villanova, Drexel Hill, Norristown, Doylestown, Merion Station, New Castle, Quakertown and many areas nearby. Let us help you dry your crawl space! Call or e-mail Philadelphia Basement Systems today for a free crawl space dehumidifier quote! We service the Pennsylvania, New Jersey, and Delaware area, including Villanova, Drexel Hill, Norristown, Doylestown, Merion Station, New Castle, Quakertown and nearby.